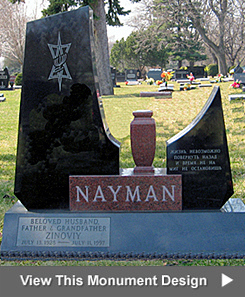 The City Monument Company is a family-owned monument company that provides its customers with quality memorials and customized monument. Our success can be attributed to our commitment to quality of service and materials, a guarantee of our work, and a willingness to cater to the needs of our customers. We are affiliated with a number of organizations. We work very closely with our national association, Monument Builders of North America, and strictly adhere to its code of ethics. We are also members of the American Institute of Commemorative Art, an invitation only association whose members are among the most accomplished designers in the industry. The Institute is an invitation only association comprised of memorial designers and craftsmen from throughout the United States and Canada. Its members represent the elite among monument companies today, both from a design perspective as well as their unwavering commitment in integrity and ethics in the marketplace. Out of the hundreds of monument companies in business today, only 48 have been invited to join AICA. Our company is honored to be a part of this prestigious organization. For more information about AICA, please visit their website at www.monuments-aica.com. 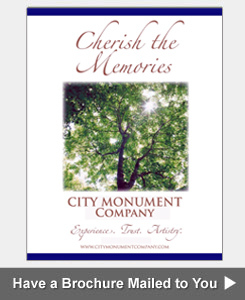 City Monument Company is a member of the International Cemetery and Funeral Association (ICFA) which provides both industry professionals and consumers with valuable resources and information. To visit their site click here. 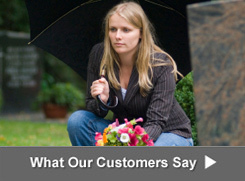 City Monument Company is also a member of the Cremation Association of North America (CANA) which helps to educate the general public on the growing trend of cremation and provide industry professionals with statistical information and support. 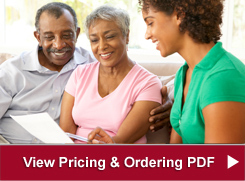 To visit their site click here.